The F-14 Tomcat, captured the imaginations of thousands of military aviation fans with its twin tails, large after burning engines and swing wing design. Due to be retired shortly in the future and replaced by F/A-18 Super Hornets, we decided to jump into a jumbo and make the short hop over the wet stuff to see the beast in action! Virtually all the Squadrons based at NAS Oceana are now either Legacy Hornet or Super Hornet equipped. Fortunately there are still four F-14 Tomcat Squadrons in operation that have not yet transferred to the F/A-18 Super Hornet. The two present at Oceana are VF-101 “Grim Reapers” and VF-32 “Swordsman”. The static aircraft display was minimal with an F-14B Tomcat “Swordsman” from VF-32 and a F/A-18E Super Hornet, single seat version from VFA-106. The first United States Navy aircraft flying demonstration was performed by a E-2C Hawkeye from VAW-120. The Hawkeye known as “The eyes of the Fleet” is always looking out for threats to the aircraft or their Carrier. It carries a radar dome on its back encasing the powerful electronic equipment similar to the E-3 Sentry aircraft. After the National Anthem, four F-14 Tomcats were launched, three from VF-32 Squadron and the other from VF-101 Squadron, specially painted with light gray and a red tail. Also to get airborne was a pair of VFA-136 F/A-18C Hornets and a pair of F/A-18F Super Hornets from VFA-211 to take part in the Air Power Demonstration. Low level fast passes in conjunction with pyrotechnics, all giving the illusion of weaponry being dropped. Plus the humidity at Oceana helped to produce incredible amounts of wing vapour! After numerous passes from the four Navy units, they disappeared to join together in a formation for the Fleet Tactical Aircraft Flyby. Leading the formation was a four ship of F-14 Tomcats with the F/A-18C Hornet pair on the left side and the F/A-18F Super Hornet pair on the right side of the formation. I was surprised to see the unmistakable shape of an QF-4E Phantom getting airborne to take part in the United States Air Force Heritage Flight. Consisting of an QF-4E Phantom which was leading the formation an F-16CJ and a pair of F-86 Sabres. The second historical formation fly past of the show included two F/A-18F Super Hornets from VFA-106 and an F-4 Corsair making up the US Navy Legacy Flight. Other preserved jet aircraft to perform at this years Oceana Naval Airshow were a pair of F-86 Sabres. Flying in close formation, with many topside passes all of which were very low, you had to be very careful not to get the parked aircraft tails in the picture! The first of two solo Hornet displays was provided by VFA-131 with a F/A-18C Hornet the tail was specially painted black with a cats roaring head. 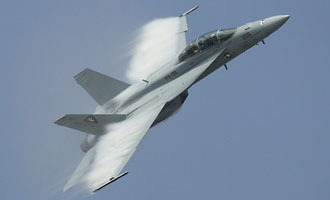 VFA-106 “Gladiators” performed the second Hornet display, this time being the F/A-18F Super Hornet. Rolling and retracting the gear after Take-Off, the Hornet performed many slow speed manoeuvres. One of the most impressive has to be while descending the display Pilot from VFA-211 pulled the Super Hornets nose up without power resulting in instant high angle of attack flight. Unlike most fast jet high angle of attack passes the Super Hornet was not pulled back into a climb but pushed down with Negative G for level flight. One of the last routine manoeuvres was a tight rolling loop. The F-14 Tomcat Tactical Demo, quoted as the last ever public display of the F-14 Tomcat. 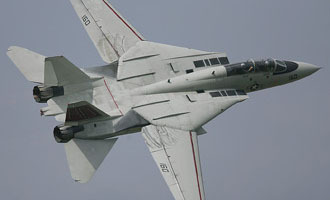 VF-101 is also due to disband in September 2005, meaning the display will be the last flying hours of the Squadron. Fully swept fast passes and reheat climbs, the Crew from VF-101 did not disappoint the thousands of Tomcat fans there just to see the Tomcat fly. Taxiing back the F-14 parked in a refueling area to be hot fuelled with the engines running before taxiing past the crowds with the American flag flying from the open canopy. The day time show was closed with the United States Navy display team, the Blue Angels consisting of a group of six mixed single and twin stick F/A-18 Hornets painted in royal blue and yellow. With a few hours break the twilight show started and the sun begun to go down. Some of the acts to perform during the twilight show included the Blue Angels C-130 Hercules “Fat Albert” performing a Jet Assisted Take- Off (JATO) in the dark and the Shockwave Jet Truck with three jet engines doing a 350MPH run in front of the Wall of Fire. Another legendary military aircraft is soon to be retired, we can only hope that a new legend will be born. We would like to specially thank the Public Affairs Office at Naval Air Station Oceana.